There are two types of art programs for the Mac. The first type gives you tons of bells and whistles that include effects, different media to use, color controls, and more. The second type focuses on one thing and tries to do that one thing well. Mischief, an app by the company Made with Mischief, is the second type. It is a bare bones paint program that has two main tools for drawing: paint and an eraser. While it sounds basic at first, it is a lot more. 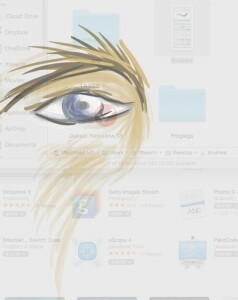 Mischief is simply a painting app for the Mac. It has paint brushes, which are adjustable by size and opacity. The size can be adjusted in overall thickness, and you can also control how the brush goes from thick to thin as it would with a “real” round paint brush. There are several presets to start with too. The second tool is the eraser. Like the brush, the eraser has settings for size and opacity. It also has presets. That’s it as far as tools go. It doesn’t appear to be much, but I actually liked only having two tools to work with. 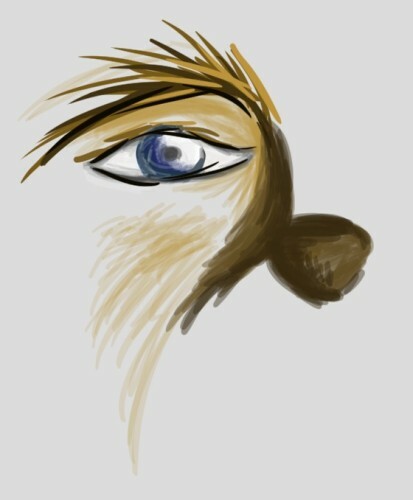 It made it simpler to use the app and I found it easier to paint. When I paint in more complicated programs I tend to use one media every time and rarely switch. If I had to pick one more tool I would want a smudge tool to help with shading. In addition to these two tools, there are a color picker and a toolbar for basic editing and moving around the image. The color picker expands to allow you to pick virtually any color you need and also save custom colors to the palette. The tools are basic like magnify, a move tool, rotate, eyedropper, and a selection tool. The selection tool is not only important for moving or deleting certain areas of your painting, but you can also select a portion of the canvas and save that as its own file. One really cool itemis a transparency tool. This tool controls the entire transparency of the canvas! This allows you to trace anything underneath that might be open in another program or right on your desktop. This tool is brilliant and makes tracing so much easier than the way other apps tackle this. Again, Mischief keeps it simple. The last palette on the screen is a layers palette, If you do a lot of artwork in any program layers become invaluable, and I am happy to see layers in Mischief. As for the canvas, it is an infinite canvas. This lets you start painting and have your creativity flow without the limitations of a paper size. This is also where the selection tool comes in handy for saving your work. Instead of saving a huge file you can just select what you want and export that to a JPG file or copy and paste into another app. This is where you can also select what resolution to save the file to. The canvas can be changed into any color or a variety of paper textures by clicking the paper layer in the layers list. I just mentioned that you can export portions of your canvas by selecting them with the selection tool. One thing you can’t do is print. This is my main issue I have with Mischief. Any paint program should have the ability to print. Why can’t you print a selected portion of you work? I hope this feature is added in an update. Sure, you can export and print in Preview or another app, but why should you need to? Overall, Mischief is a great paint program for the Mac. I really like it. From painting to cartooning you can get it done in Mischief. Even with the lack of printing it is an app that I can recommend at a price of $24.99. A free lite version is available on the company website. I look forward to seeing Mischief grow in future updates, but I hope the development team doesn’t add too much and keeps the app simple like it is now.